Vintage bakelite buttons, beads, glass tiles, and findings We bet that if you’re a bakelite jewelry fan, you’ve seen pieces similar to this, but at much higher prices. 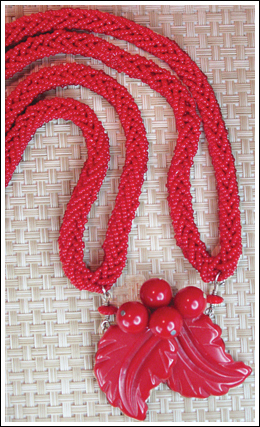 Our 17" necklace features bright cherry red vintage plastic carved leaves and berries on a chain made of double strands of intricately woven glass seed beads, with a metal loop clasp. The bold design and vibrant color will look fabulous with vintage clothes and will certainly add pizzazz to a new outfit.